Russia’s new twin-engine MC-21 jet is intended to revive the nation’s aircraft-making prowess and reduce its reliance on Boeing and Airbus planes. MOSCOW — Russia on Wednesday rolled out a new airliner that is intended to revive the nation’s aircraft-making prowess and reduce its reliance on Boeing and Airbus planes. 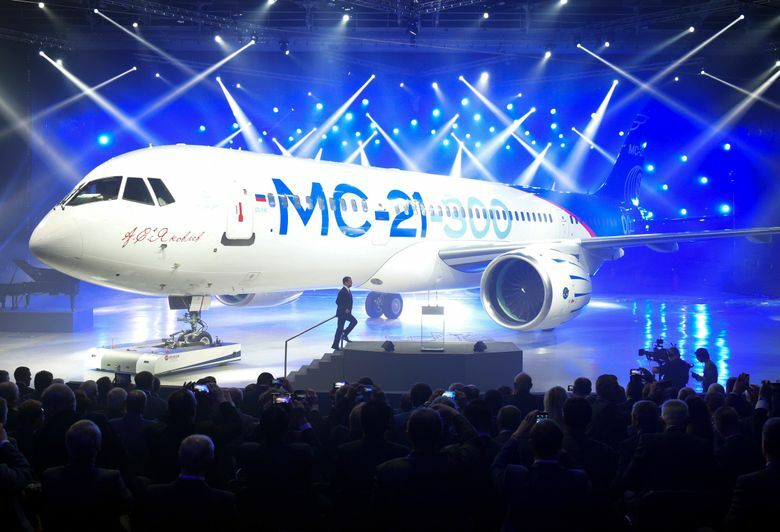 The MC-21, a twin-engine short- and midrange passenger jet, was unveiled in the Siberian city of Irkutsk. Russia’s government has spent about $3.5 billion developing the aircraft. It is built by Irkut, the maker of Su-30 fighter jets. Unlike the old Soviet designs, the new jet is built with a significant amount of composite materials that help reduce weight and enhance fuel efficiency. It can be powered by Pratt & Whitney engines or new Russian-built engines, which are being finalized. The new plane is expected to conduct its maiden flight next year, and deliveries to Russian flag carrier Aeroflot — the country’s biggest airline and a Boeing and Airbus customer — are set to start in 2018 at a list price of about $90 million per plane. Irkut has so far received orders for 175 planes, including 50 for Aeroflot. Various models of the MC-21 are designed to carry from 165 to 211 passengers. Aeroflot and other Russian airlines have increasingly relied on Boeing and Airbus planes, but the government has made the revival of domestic aircraft-making industries a top priority. The MC-21 will take on Boeing’s 737, the world’s best-selling airliner, and Airbus’ A320 series. The model, which will succeed Russia’s Tupolev Tu-154, will be wider than its rivals, while Irkut will also make a shorter, 132-to-165-seat version available. Irkut is targeting a 5 to 10 percent worldwide market share for the model by 2035, Oleg Demchenko, head of the division, said last week in an interview. The manufacturer is “constantly” in talks with potential customers, including leasing companies, and “I’m sure it will be in demand on the global market,” he said. Irkut was combined with other aerospace manufacturers into state-controlled United Aircraft about a decade ago as Russia sought to develop a more global market presence. A sister division, Sukhoi, began deliveries in 2011 of the Superjet 100, a 93-seat regional airliner that competes with models from Montreal-based Bombardier, including smaller versions of the new C Series, and Brazilian producer Embraer. United Aircraft’s efforts to build a presence outside former Soviet countries have yet to take off. All 175 orders for the MC-21 so far have come from customers based in the region, and the model will be starting service in economies that have been battered by low prices for oil and metals. Of the nine buyers of Sukhoi’s Superjet 100, two are from outside the former Soviet Union: Mexican carrier Interjet, which started flying the plane in 2013, and Irish airline CityJet, which began operating it this month. Russian Prime Minister Dmitry Medvedev hailed the new MC-21 as the cutting edge in aircraft design, superior to Western planes currently in service. Information from The Associated Press and Bloomberg News is included in this report.